Born out of a mutual love for crunching breakbeats and twisted sub bass, the production duo that are C-Sonix represent yet another exciting artist collaboration to emerge within the drum & bass scene. Both Tony Weaver AKA Mr Bang-e and Matt Rees AKA Sephiroth have their roots firmly entrenched in music. For Mr Bang-e, this has been a 20+ year journey as a highly regarded DJ in clubs across Europe alongside the biggest and best on the scene. Whereas for Sephiroth, many years have been spent honing his production skills working on solo projects for various labels around the world. Although both continue to follow their solo paths, the collaboration is a strong one with many exciting releases on the horizon. 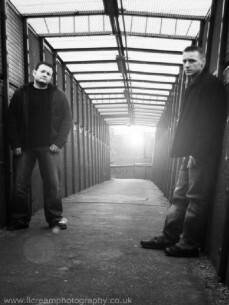 Despite a relatively short time working together, their tracks to date have already shown enough quality and originality to be signed by IDJR, Melting Pot, Broken Audio, Sinuous & Close 2 Death Recordings with regular DJ support coming from respected figures such as Raiden, Meth, Phobia, Allied, Kano, Disphonia, Treo, DBR UK, Adi-J and many others besides. With their stock rising and label interest growing, you better believe this is a combination to watch out for!